The Director’s Cut is a core rulebook for the modern action Killshot role-playing written by The Warden and published by Broken Ruler Games. Killshot utilizes a dice pool determined by the different Options used during each action (leading to the game mechanic’s name Optional System). The more skills, abilities, and knowledge you can attach to your action, the more dice you add to your pool. In addition, all dice rolls are resolved by opposing rolls instead of static (or even dynamic) target numbers. Thus the more dice you add, the better your luck. However, a bad dice roll, regardless of the number of dice, can still see you failing miserably. This only adds to the strategy of your actions by forcing the player to make better decisions to improve their odds of rolling higher than the director. The end result is a completely interactive game with decisions and trade-offs leading to more success in the actions the characters take. But, and this is a good but, the game system favors the player characters by giving them the advantage in pretty much every situation. Killshot is truly a game designed for excellent gaming experiences where the characters are in control of the setting instead of trying to simply overcome the difficulties the setting provides them. It’s like writing a movie script or playing a video game where your protagonists are the main focus and everyone around them is simply there to make the protagonists’ stories that much cooler. You’re Hired is an introduction to Killshot from the player’s viewpoint, written in the style of a boss speaking to a newly hired employee. This talks all about what it means to be an assassin and the basic knowledge to keep you safe. In addition, it serves as an overview introduction to the Optional System along with providing example game-play. The Rules is the actual explanation of the Optional System and all its major components, especially those during action resolution. There are lots of options involved during action resolution, and these are provided here as an overview. Character creation starts here by determining the character’s base attributes Body, Sense, and Mind. Focus is the next part of character creation that defines what a character’s specialty is (similar to an archetype, but more flexible). Options are the base of the Optional System. Each option falls into a specific category that can be used in different ways to provide bonus dice to your dice pool during action resolution. The options listed here relate to the different actions one can perform during resolution. Reactions are add-ons to actions being performed and may affect your success or failure during resolution. Skills are trained abilities that characters can use to improve their chances during action resolution. If applied correctly, they increase your dice pool and thus increase your chances of succeeding. Traits are add-ons to the character that apply in different ways depending on the action being performed. These too may affect your success or failure during resolution. Gear is equipment and modifications to equipment applicable to Killshot including armor, tools, vehicles, and weapons. Directors Wanted is the Directors introduction to Killshot and how their job differs from the players’. Understanding Killshot is a behind-the scenes look into Killshot and the Optional System to aid the Director in constructing, running, and resolving missions. Building & Running Jobs is a deeper look at how to construct missions (called jobs) including a collection of pregenerated adversaries. Beyond the Job takes a look at what happens after the job completes in terms of offering achievements and contacts and dealing with evidence points. The Dead Can’t Testify is a collection of three linked jobs to get game-play started. These also serve as a good template for constructing your own jobs. Killshot is a very interesting take on action in a modern setting. When you think of the big box office action flicks, this is the style of storytelling involved. The characters don’t stop what they’re doing so the enemy can take a turn, they keep on going until the enemy is taken out or something external interferes. In Killshot, you get the chance to recreate that cinematic appeal in action movies and video games. Just make sure you don’t leave the wrong clues for the authorities to find. The Director’s Cut (using the review copy) is designed for PDF use and I dare say even handheld device use. The utilized one-column content layout with a side column for tips and tactics means the bulk of the material is extremely easy to read electronically. The page layout is not ideal for print, but then the book is not designed around print, it’s designed for maximum PDF use (with layers to make it more printer-friendly). The illustrations look great, the layout and formatting are excellent, but more importantly, important game mechanics, when first mentioned, are picked out in red instead of the standard black font. This helps to grab the eye while reading, bringing attention to the more important things. Overall the book is very well-assembled. The Optional System is a very unique and dare I say innovative dice pool system, provide the advantage to the players in almost every situation. Resolving combat is extremely cinematic and the abstract methods of determining movement and range are superb for a modern setting. While reading through this book, you almost get a sense of being in a movie or video game as the mechanics really provide that high-action feel where the player characters are really the only important thing in the entire story, everyone else is just support. The concept of being an assassin may not appeal to all and the thought of killing important figures for pay can play on people’s morals. With that being said, the game has a definite appeal for those who like to involve strategy in their games alongside how they design their characters – every characteristic of your character has potential to providing a bonus (or maybe a penalty) to whatever action you take. Being a very interactive resolution system, the players will most likely spend little time waiting for their turn to occur. It’s a constant back and forth between what actions to take now and what actions to take next, judging on the director’s response. This is much more than “what power should I use this time” and more like “should I climb this ladder and hunker down or do I dive behind this dumpster and wait for the mark to pass by?” Using modern weapons truly enhances these concepts as your “battlefield” is so much larger due to the range capabilities of your weapons. 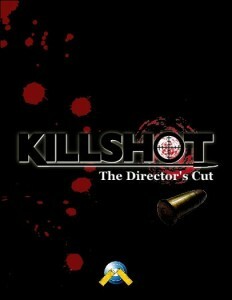 Killshot is a very unique take on role-playing games backed by a truly cinematic game system. The Optional System truly attempts to recreate scenes you may see in your favorite movie whereas the main characters are truly the main characters and not just another person trying to be a hero in a setting filled with heroes. Why not reward your players’ strategic maneuvers by allowing them to keep going? In Killshot, you can, and the reward is a game that makes you think about how you do your job as much as it does actually performing that job. In other words, how can I complete this job without making a mess or how do I make it look like someone else did it?